A pretty town in the foothills of the Western Ghats, Kottayam is a commercial centre noted for its trade in rubber, pepper, tea etc. Kottayam is also one of the main centers of the Syrian Christian faith and has some beautiful churches. They include the Valiapalli Church noted for its Persian cross and the Cheriapalli church, which has fine murals and paintings. It is possible to travel from Alkappuzha to Kottayam on the ferry along the lagoons and picturesque waterways, getting a feel of the scenic beauty of this region. Kottayam is also a good base for a visit to the Periyar National Park; Just 10 km away lays Kumarakom. Here is a delightful spot beside a lake, which is home to rare migratory water birds. Traditional Kerala ‘tharawad’ style houses, at a resort here, offer a perfect Kerala gateway. 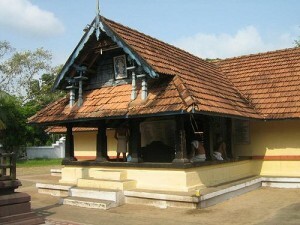 Close by, is the Shiva temple at Ettumanoor with its lovely murals. Kumarakom: Kumarakom is located 10 km from Kottayam. A voyage north of Alappuzha takes you to the rich green, sleepy little village of Kumarakom on the Vembanad Lake, An enchanting picnic spot, Kumarakom provides boating, fishing and sightseeing experiences that are truly exhilarating. An exclusive attraction is the Kumarakom Bird Sanctuary, which are an ornithologist’s paradise and a favorite haunt of migratory birds like the Siberian stork, egret, darter, heron and teal. A cruise along the Vembanad Lake is the best way to view the bird life. This entry was posted in Kerala, Kottayam and tagged cochin kottayam, kottayam district, kottayam kerela, kottayam map, kottayam maps, kumarakom, kumarakom kottayam. Bookmark the permalink.